The purpose of this paper is to describe a possible design for a Life Cycle adapted for use by the visually impaired. Although there are several companies producing some adapted equipment for people in wheelchairs, there is no equipment produced with the visually impaired in mind. We looked at common aerobic equipment produced for use in fitness centers, and found that they all utilized flat panel displays with membrane keypads and digital output. In order to use one of these devices, a person would need to read the instructions printed on the panel and enter the proper data on the keypad. According to a representative of Life Fitness Corporation, there is no equipment currently manufactured with alternative displays. The problem we choose to look at was developing some way to interfacing with the flat panel display of a piece of aerobic equipment. The idea was to develop a technique that could be applied to different types of equipment. The first thing we needed to do was to determine exactly what the problem with the interface was. The first problem was that the instructions for the use of the bike were printed, in small print, on the flat panel display. In order to use the device, the user would have to read instruction on how to start the device and how set the device to obtain the desired results. The second problem is, as the user enters information into the bike's computer, the computer displays the choices that were entered on a set of LED displays. A user with a visual impairment would not receive the feedback they need to ensure the bike is programmed correctly. Additionally, information is entered using a membrane keypad, which is flush with the display and difficult to locate using tactile clues. The third problem is as the user's fitness program progresses, the computer displays information, i.e. speed, rpm, and heart rate, on the LED display. Once again, a visually impaired individual would not be able to rely on this feedback, and consequently may not use the bike in a beneficial way. This means that the user needs a system capable of providing operating instructions, giving them feedback as to the information that was entered, giving feedback as to the current operating status of the bike, and a method of locating and properly inputting information into the membrane keypad. The solution to making the membrane keypad distinguishable and providing cues as to where the different buttons are located is relatively simple. Braille stickers may be placed on each button, thus allowing a user familiar with Braille to locate the keypad, and locate each button. The solution to providing output is more complicated. One possible solution would be using a refreshable Braille strip as output. However, a device such as a refreshable Braille display would be mechanically complicated, and cost prohibitive. Additionally, there is a lot of dirt and sweat in the surrounding environment that might interfere with and damage the mechanism. Another possible solution is using audio output. Audio interface devices are relatively inexpensive, versatile, and easy to use. Additionally, audio devices can be highly adaptable to different devices. For this project, we decided to recommend placing Braille stickers on the membrane keypad, and to develop an audio device capable of interfacing with the existing Life Cycle circuitry. After examining the circuitry of the Life Cycle, we discovered that the electronics consist of two separate boards. The first board is the computer. It controls all the functions of the bike, like resistance, measuring heart rate, monitoring speed, calculating energy expended, etc. The second board is the visual display board. It contains all the LEDs, and the circuitry needed to drive them. The two boards are connected together with an 8-pin connector. The pins transmit binary code to the output board telling it what data to display, and where to display it. An easy way for us to capture this data so we can signal a digital audio output device is to use the Basic Stamp II BS2-IC (see Figure 2). For this project and report, the device we looked at was the LifeCycle 9500HR (see Figure 1). 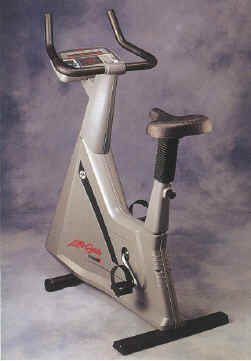 This is a stationary exercise bike designed for heavy-duty use in fitness centers. We choose to look at this bike because it would be a likely candidate for wide spread usage of this adaptive technique and we have access to one to look at. The modifications should be minimally invasive into the factory circuitry of the factory system. The Basic Stamp II is a microprocessor and interface board with incorporated power supply and 16 input/output ports. Eight of these ports could be set to read the data on the eight pins between the bikes computer and display board, without interfering with the circuitry of the bike. The processor could be programmed to decode the messages being passed to the computer, and signal for audio output. Please note that we have not decoded the signals between the bike computer and output board. Once the Basic Stamp II determines what information has been passed to the output display board, it will send a signal to the QuickVoice VM-420E (see Figure 2), a digital audio storage and playback device. This device has 8 programmable ROM chips on it, and each chip can hold 16 separate messages. The device can store a total of 128 messages. The messages are accessed by sending a signal to the QuickVoice indicating which chip of the 8 chips the message is stored on, and in which of the 16 places the message is stored. This requires 3 pins to indicate what chip, and 4 pins to indicate which message. Additionally, one pin is required by the QuickVoice to indicate when it should access a memory location and play a message. A total of 8 pins of input is required by the QuickVoice to access and playback a digital message. The Basic Stamp II has 8 more pins that can be used to access the QuickVoice. The QuickVoice would be have its output connected to an amplifier for headphones. All the circuitry should be placed in a case that is water and impact resistance. The case should fit inside the facade cover of the bike, located under the visual display. The final part of this device is the output. We choose to use the Koss GT/4 headphones. We were looking for headphones that had a volume adjustment located on the cord, and had removable ear pads so that the foam could be replaced. The 8 pins between the bike computer and the bike visual output are connected via ribbon cable to Basic Stamp II microprocessor unit. The Basic Stamp II identifies the signal being sent to the visual display, and sends a signal to the QuickVoice unit to play the corresponding message. The message is played though headphones with user controlled volume. the random program. Press 3 to use the manual program"
"You have selected random. Type in 1 though 12 to select resistance level." "You have selected level 6. Program starting." Then as the user rides, information such as distance, calories burned, and speed are displayed for 10 second intervals on the display. The bike will read this information to the user is they leave the headphones plugged in. From data we gathered using a decibel meter, the average sound level in the Wright State Fitness Center is 60 dB when few people are using equipment and 80 dB when the center is busy. This is the sound in the human auditory range. We determined the volume of the headphone should be between 65 and 90 dB. This should allow the user to hear the output over the surrounding noise, and still will not harm them unless they are exposed for several hours. Additionally, the voice to be used for the digital recording should be a female voice. Human Factors research has shown that in situations in which instructions are given, a female voice is more acceptable than a male voice. Male voices should be used when giving warnings. This reports outlines a recommendation for the design of a device to aid visually impaired persons in the use of aerobic fitness equipment, specifically the Life Cycle 9500HR. This device overcomes the obstacles of using a membrane keypad by adding Braille stickers to the buttons, and augments the visual display with audio output via headphones. If this device were built and integrated into a fitness center, hopefully it would help visually impaired patrons use the equipment independently, without needing someone to program it for them.